Morgan Stanley raises its price target for Alphabet to $1,515, the highest forecast of any Wall Street brokerage and implying 20 percent upside. For analyst Brian Nowak, Waymo's leadership in the global race to develop driverless cars had not been fully incorporated into expectations. "We see the launch of Waymo's ride-hailing service by year-end as a potential catalyst for value realization," the analyst says. Larry Page, CEO of Google's parent, Alphabet. The accelerating success of Alphabet's self-driving car unit, Waymo, spells big upside for stakeholders, according to Morgan Stanley. The bank raised its price target for the tech titan to $1,515, the highest forecast of any Wall Street brokerage and implying more than 20 percent upside over the next 12 months. For analyst Brian Nowak, Waymo's leadership in the global race to develop driverless cars had not been fully incorporated into investor expectations. "We see the launch of Waymo's ride-hailing service by year-end as a potential catalyst for value realization," Nowak said in a note Wednesday. "We believe current Alphabet valuation ascribes little value for Waymo, implying it is still a call option." He added that while Morgan Stanley currently values Waymo at $45 billion, the brokerage's research indicates the segment could grow to $175 billion in value as it expands its ride-sharing, logistics and licensing businesses. Nowak's higher targets came just days after a business registration filing revealed that Waymo has established a subsidiary in Shanghai, the latest evidence that the U.S. internet giant is trying to break into the Chinese market. For the driverless car unit, China offers business and logistics consultancy as well as car-part design and testing services. On the flip side, China has been trying to keep pace with the U.S. in the autonomous vehicle industry and could stand to benefit from having Waymo closer to home. Alphabet's Google, which left China's search engine market eight years ago, has been actively seeking ways to rejoin the country where regulators block many of its products. To be sure, Waymo still faces a number of key hurdles, including legislative challenges, expansion into new cities and adoption rates, Nowak said. Recently, residents in a Phoenix suburb where Waymo has been testing its vehicles gave The Information a unanimous assessment of the cars: "I hate them." The backlash largely stemmed from frustrations with how the cars operate, including sudden stops or delayed turns. The local complaints highlight the difficulties faced by self-driving cars, which are programmed to drive conservatively in order to master situations that humans ordinarily handle with ease. Despite these early-stage hiccups, Nowak argued that operations should improve with time. "As Waymo grows, we see investors putting a higher success likelihood and value on the asset," he said. "Every 10 percent realization of our total potential Waymo value translates to about $25 per share." 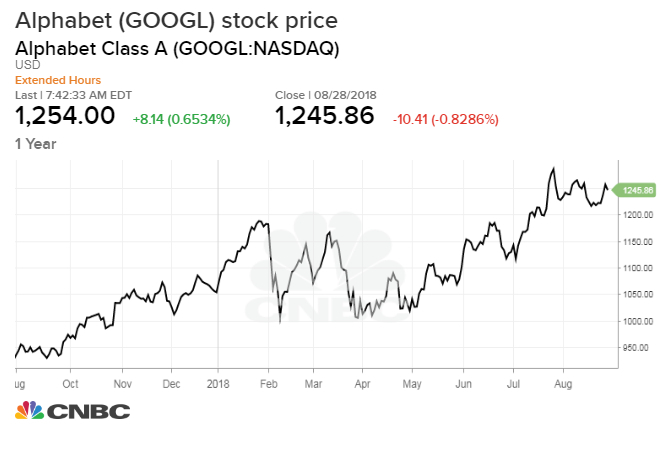 Shares of Alphabet's Class C stock rose 0.4 percent in premarket trading following the Morgan Stanley note. In another note Wednesday, Nowak also raised Amazon stock's price target to a Wall Street high $2,500 per share.